Reading’s Classic II Steel Service Bodies are constructed from the highest quality A60 coating weight steel to assure the very best corrosion protection for the long haul. Each Classic II Steel Service Body comes with a 6 year limited warranty. The Classic II Steel Service Body, available for both single rear wheel and dual rear cutaway vans, offers features not found on any other service body. A few of these features include an exclusive, patented, secure internal compartment hinge that is easy to replace without special tools and is fully adjustable. Other features include A60 coating weight steel pressed diamond plate floor, and state of the art E-Coat priming system and durable Powder Coat finish. The Aluminum Service Body offers an unbeatable combination of standard features, useful options, and the know-how of over 25 years of refinement. 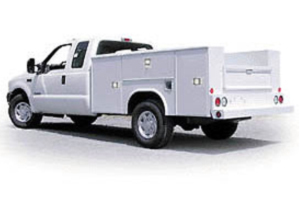 The aluminum service body is completely manufactured from more than 50 percent recycled high-strength alloy aluminum to produce a strong, durable, and environmentally friendly aluminum truck body. With a 10-year limited warranty and quality manufacturing backed by the Reading name, this service body is designed for efficiency today, and built to last for tomorrow. 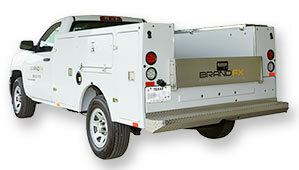 BrandFX EverLast™ composite service bodies offer a number of advantages compared to conventional metallic bodies. These bodies’ advanced composite construction delivers a unique combination of high-strength, lightweight, durability, and fuel efficiency – earning them the distinction of being the Life Cycle Value Leader in the industry. The lighter weight of these bodies can reduce wear on tires, brakes, and suspension members, and even add to the capacity of a truck. In some cases, the lighter weight of a BrandFX EverLast service body will actually allow an operator to downsize vehicles. 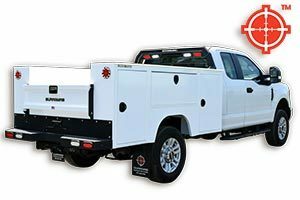 Easily repaired and corrosion resistant, these premium service bodies are also designed to maintain their quality appearance over many years of service life.